The Underground Film Journal was painfully disappointed that neither The Hurt Locker nor its director, Kathryn Bigelow, won a Golden Globe the other night. We can only hope that the film fares better — way better — on Oscar night. Other than that Golden Globe, so far the film has been racking up all kinds of awards, particularly from critics’ associations such as the Austin Film Critics Association, Boston Society of Film Critics and the Chicago Film Critics Association; plus, it won two awards from IFP’s Gotham Independent Film Awards. 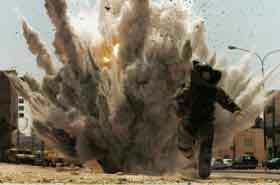 The Hurt Locker made only a modest sum at the box office, but hopefully the award season accolades its been receiving will encourage a larger audience to find it on DVD (Amazon | Netflix). 1. Nice Bombs, directed by Usama Alshaibi. Alshaibi was born in Iraq, spent his early years both there and in the U.S.A., and currently makes his home in Chicago with his American-born wife Kristie. After Saddam Hussein is ousted from power, Alshaibi and Kristie travel to his home country to reconnect with family members he hasn’t seen in over 20 years. What he captures on camera is a mesmerizing personal journey filled with humor, sadness, confusion and uncertainty. 2. Occupation: Dreamland, directed by Garrett Scott and Ian Olds. In the winter of 2004, Scott and Olds were embedded with the Army’s 82nd Airborne for six weeks in Fallujah, shortly before what would become the site of the war’s biggest and deadliest battle. What the directors found were soldiers fully committed to following orders and bringing peace to the Iraqi citizens, yet conflicted as to whether or not they could actually achieve their goals. 3. The Short Life of Jose Antonio Gutierrez, directed by Heidi Specogna. Gutierrez was the first American casualty in the Iraq War, except he wasn’t even American. An orphan from Guatemala, Gutierrez signed up for the Marines in order to get an education and citizenship after emigrating to the U.S. Alas, he was killed on the very first day of the invasion and this film documents his life and story by those who knew him best. 4. Heavy Metal in Baghdad, directed by Suroosh Alvi and Eddy Moretti. Yes, it’s still possible to rock out while your country descends into complete chaos. Acrassicauda is a band that defies the odds: Not only trying to bring music to a war-weary populace, but heavy metal — the most Satanic of all music — to a predominantly Muslim nation. But, like kids everywhere, they have a dream that just can’t be squelched.